CELLULOID JUNKIE EXCLUSIVE: It seems that China’s Wanda – the world’s biggest cinema operator and owner of American multiplex chain AMC – has broken its own embargo on an announcement for an expanded deal with 3D vendor RealD. It looks like this deal was set to be announced on Monday next week (24th of March), which is the international day of CinemaCon and the day these type of deals typically get announced. 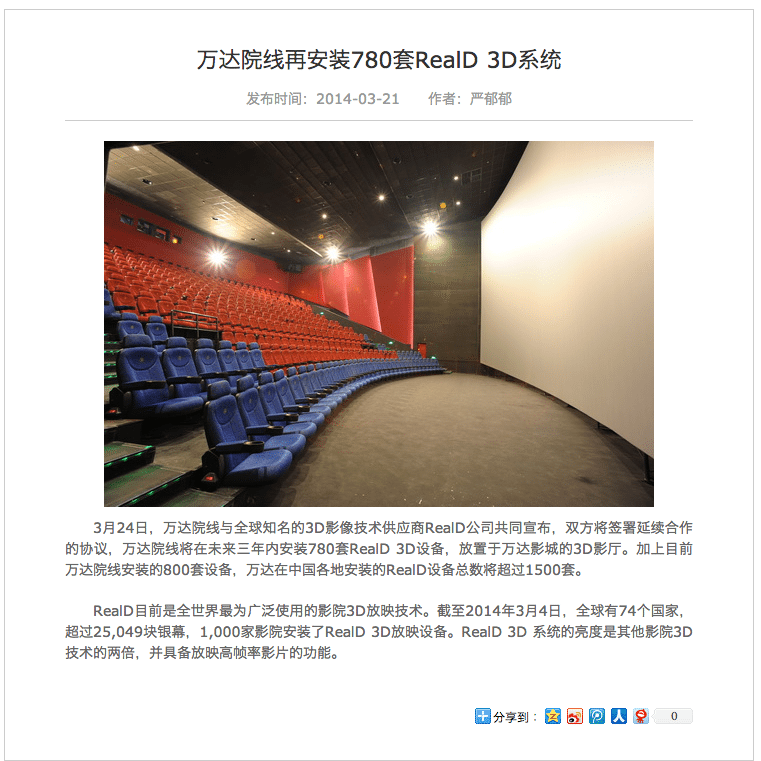 March 24, Wanda Cinema 3D images with the world-renowned technology provider RealD jointly announced that the two sides will continue cooperation agreement, Wanda Cinema will install 780 sets of RealD 3D equipment in the next three years, placed in Wanda Cinema The 3D movie hall. Plus 800 sets of equipment currently installed Wanda Cinema, RealD equipment Wanda total installed throughout China will be more than 1500 sets. RealD is currently the world’s most widely used 3D cinema projection technology. As of March 4, 2014, there are 74 countries worldwide, more than 25,049 screens in 1,000 theaters install RealD 3D projection equipment. Brightness RealD 3D theater system is twice that of other 3D technologies, and have screened the film features a high frame rate. The fact that the story (press release?) is dated March 24th means that it was most likely to be on hold until that date, but somehow the Chinese version was posted on Wanda’s website too early. If this is the case, this is a serious slip-up as RealD is a publicly listed company and a big deal like this could give its share price a bounce. Wanda had a previous deal in place with RealD from 2010 for 500 screens. Below is the original in Chinese. BEIJING, March 21 (Reuters) – China’s Wanda Cinemas, the cinema subsidiary of Dalian Wanda Group, will install 780 sets of RealD Inc 3D equipment in cinemas in China over the next three years, the company said on its website on Friday. Dalian Wanda is a Chinese conglomerate with interests in commercial property, hotels and tourism. In 2012 it bought U.S. cinema chain AMC Entertainment Holdings Inc for $2.6 billion.